If you want to take advantage of the full functionality of PANALIS Monitoring, the PANALIS Enterprise Edition is just right for you. With PANALIS Monitoring Enterprise you have an unlimited number of user accesses. In the future, your team will be able to expand flexibly, without having to fear any restrictions when working with PANALIS Monitoring. Likewise, there are no limits in monitoring topics and stakeholder groups, so the Enterprise Edition can create an unlimited number of personalized monitoring lists. Since the Version-Update-Guarantee is included in this edition, you will always be up to date with your PANALIS edition and guaranteed the latest functionality of PANALIS Monitoring. In addition, with the option to implement up to 2000 own sources, you have the possibility to customize PANALIS Monitoring according to your requirements. To ensure a seamless digitization of your monitoring processes and policy observation, the PANALIS Monitoring Enterprise Edition includes a free team workshop. In addition, of course, as with all other PANALIS Monitoring editions, you have free support from our team. In contrast to search engines and information portals, PANALIS simplifies your access to daily updated data and information from your most important sources. You personalise your search – PANALIS selects the results precisely according to your preferences. Whether as a means for crisis prevention or for recording your regulatory requirements – PANALIS helps you to observe the environment and to implement your compliance. 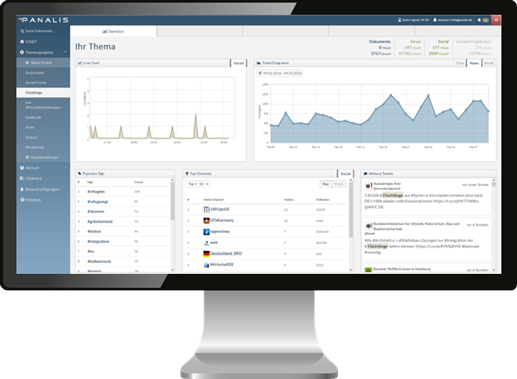 Trends, social discourses and correlations can now be analysed on a single interface and used as an early warning system. With PANALIS, manual searches on the Internet or in official databases are almost completely eliminated. Projects and campaigns can be designed more effectively and information losses are minimized. PANALIS Monitoring shows you the publications of all stakeholders. Identify important trends and opinions at an early stage and individualize your stakeholder observation. The simple rights management makes it possible to work on each topic project with additional team members and helps to optimize the internal provision of information and your project management. With the notification features, you won’t miss any information. Individually configurable e-mail reports provide you with a summary of your topic projects. More than just a search engine: Whether own hints and comments or indexing and rating – with PANALIS Monitoring information can be managed professionally and intelligently. No trend remains hidden by the dashboard. Statistics give you a complete overview – from posts in social media to legislative resolutions. Archiving secures the information and knowledge status permanently. Access your stored results at any time and use them as a basis for future projects. You can test PANALIS Monitoring flexibly and risk-free.